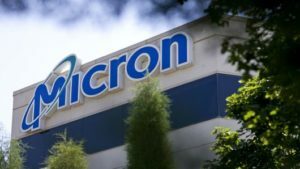 Micron Technology (NASDAQ:MU) reported its quarterly earnings figures late Wednesday afternoon, amassing positive results that played a role in MU stock surging after hours. The Boise, Idaho-based semiconductors business said that for its second quarter of its fiscal 2019, it brought in net income of $1.62 billion, which was roughly $1.42 per share. The figure was less than half the profit it brought in during the second quarter of 2018, when it earned $3.31 billion, or $2.67 per share. Micron posted adjusted earnings of $1.71 per share for the period, topping the Wall Street guidance of $1.60 per share, according to a survey of 29 analysts conducted by FactSet. Revenue took a hit, sliding 20.5% when compared to the year-ago quarter and arriving at $5.84 billion. Wall Street saw the chip maker as raking in sales of $5.81 billion, per the survey of 27 analysts that FactSet conducted, but below the $5.92 billion the company was projected to bring in at the beginning of the month. Micron CFO David Zinsner said 64% of the company’s revenue came from sales of dynamic random access memory (DRAM), roughly $3.74 billion, which is below the Wall Street forecast of $3.94 billion. He added that 30% of sales came from NAND revenue, which was $1.75 billion, ahead of the $1.53 billion that analysts predicted. NAND are flash memory chips often seen in USB drives, as well as a plethora of smaller devices, including digital cameras. MU stock is up 4.7% after hours Wednesday. Article printed from InvestorPlace Media, https://investorplace.com/2019/03/micron-technology-earnings-mu-stock/.